I must admit, I stole this theme idea from my Twinsie Tuesday group. But it is such a fun one I thought my fellow moms would really enjoy it too! Basically, the group is divided up, and we give each other any theme we want. 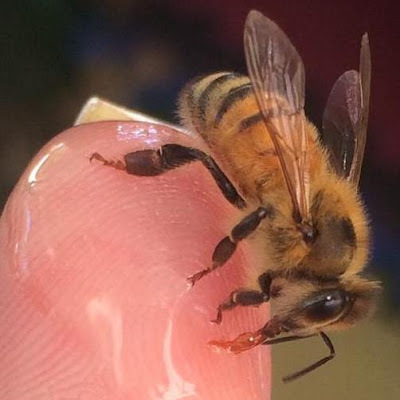 My boss was Rosie, and she was inspired by the pictures I took when I was hand-feeding bees - letting them eat honey from and crawl around on my fingers - to give me the theme "bee nails". When I think of Rosie, one of the first things I think of is rainbows. So to honor her and her mani order, I decided on some rainbow bee nails! For my base bee colors, I used Sally Hansen Peach Babe (thumb), Dermelect Above It (index), and a few SinfulColors from their new Back-to-School 2015 Chalkboard Diaries collection (which I'll be sharing some swatches from tomorrow): VIPeach (middle), Truth or Lavendare (ring), and Chalk it Up (pinky). The bees' stripes, wings, and eyes are white and black acrylic paint. For their stingers, I chopped off the pointy ends of orange wood sticks and painted them with acrylic paint. I really love how these turned out! I tried to get creative with these, and they were so much fun!! Thank you for the theme, Rosie! To see what all the moms did this week, check out the #MommysManiMonday tag on Instagram!